"I'm loving my Apple Watch. The activity and fitness tracking is great and I am surprising myself with how useful it has been in other situations. 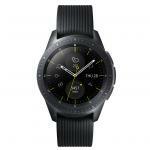 I've been pleasantly surprised with the battery life..."
"Awesome smart watch. Great if you are in to health and fitness. Highly recommended." Apple Watch Nike+. Get connected through sport. 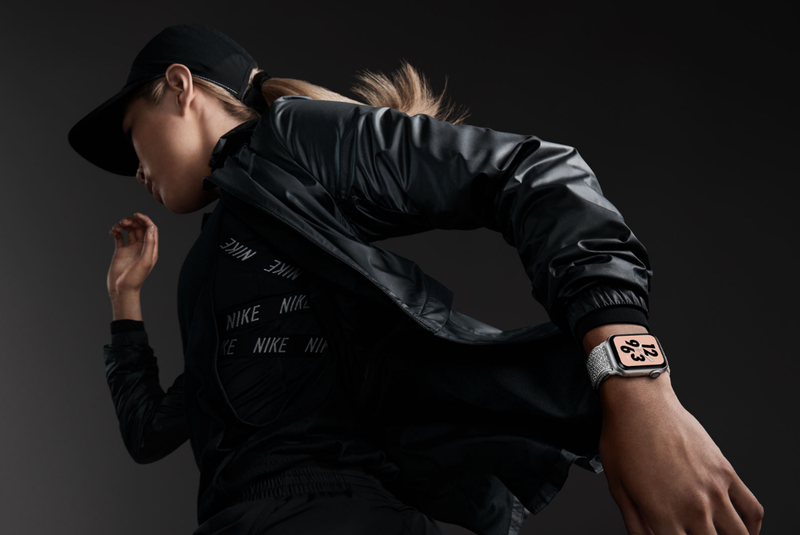 Apple Watch Nike+ is the perfect running partner with the Nike Run Club app. But for most people, that's just one facet of their training. That's why Nike created the Nike Training Club app, to let you tap into a world of different workouts and experts. Together, Nike Run Club and Nike Training Club will help you build the endurance and strength to take your fitness to the next level. Reflective Nike Sport Loop. Be seen in all the right places. Squeezing in a run often means hitting the pavement before the sun rises or after it sets. 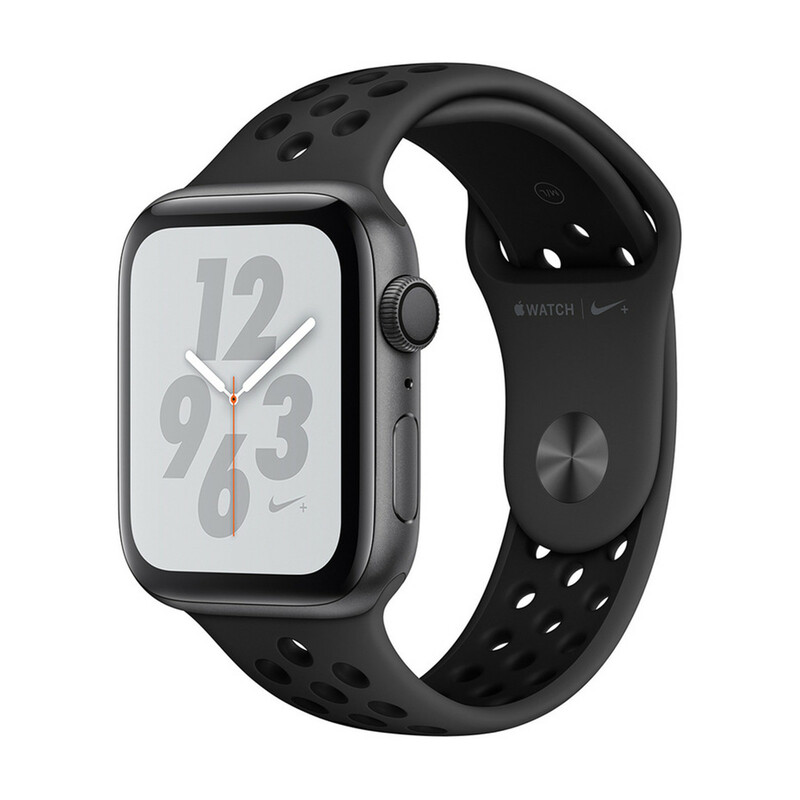 To help you stand out, Apple Watch Nike+ Series 4 is now available with a Nike Sport Loop band that's woven with special reflective thread designed to shimmer when light strikes it. 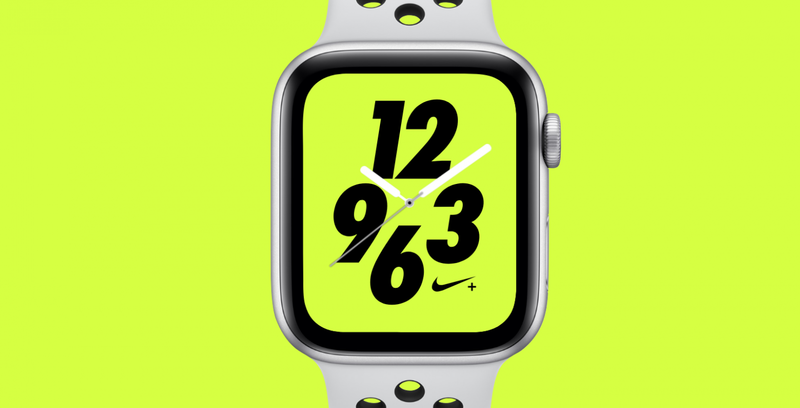 Nike watch faces pushed further. Curved corners and reduced borders create a display that's over 30 per cent larger than the previous generation. 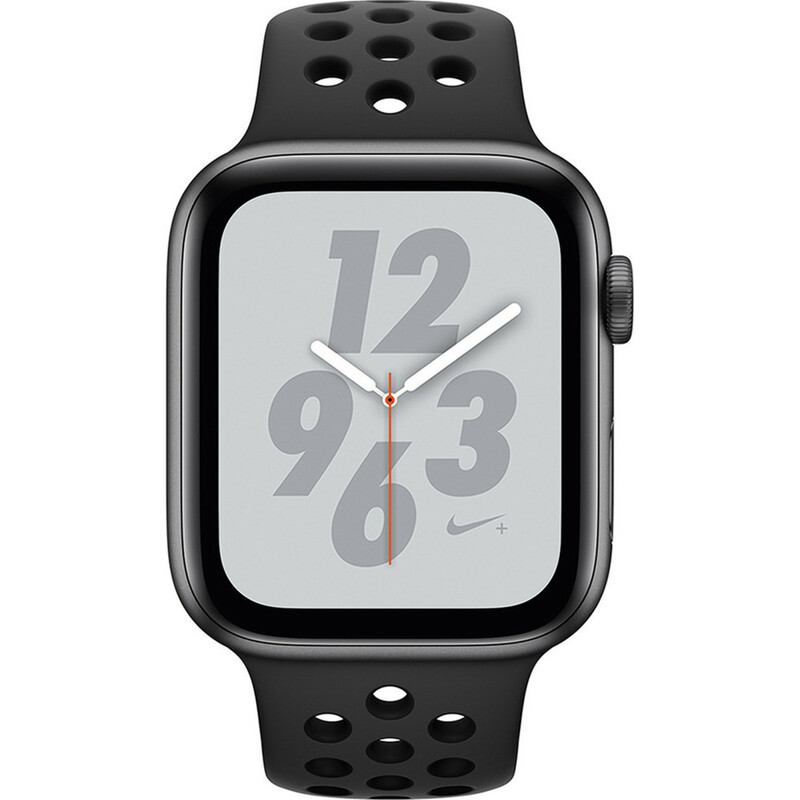 Let exclusive Nike watch faces with bold colours set the tone for every stride, rep or moment of the day. Not just evolved, transformed. 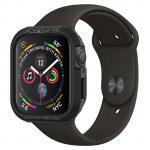 Series 4 represents a fundamental redesign and re-engineering of Apple Watch. From the curved corners of the larger, all-new display to the architecture of the S4 chip, every detail has been thoughtfully considered. Apple Watch has always been a uniquely personal product. And now it's even more powerful. 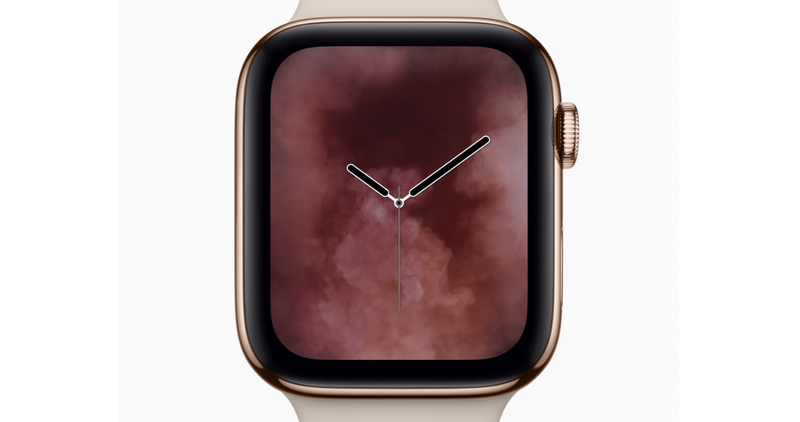 The display is the defining feature of Apple Watch, and Series 4 pushes it further than ever. The challenge was to make it bigger without noticeably increasing the size of the case or compromising the battery life. 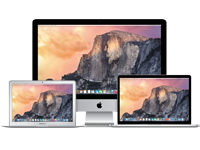 Narrower borders enable a viewing area that's over 30 per cent larger, while a new display technology called LTPO improves power efficiency, helping you get through the day on a single charge. A better experience all the way round. Curved corners precisely match the radius of the case, creating a more pleasing, continuous appearance. This also allows imagery and the touch surface to extend to the furthest reaches of the screen. More information in every millimetre. 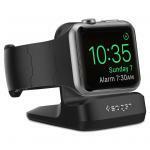 The Digital Crown was invented to provide an easy way to navigate on Apple Watch without obstructing the display. With Apple Watch Series 4, the mechanism has been totally re-engineered. Haptic feedback now delivers a precise, click-like feel as you scroll. 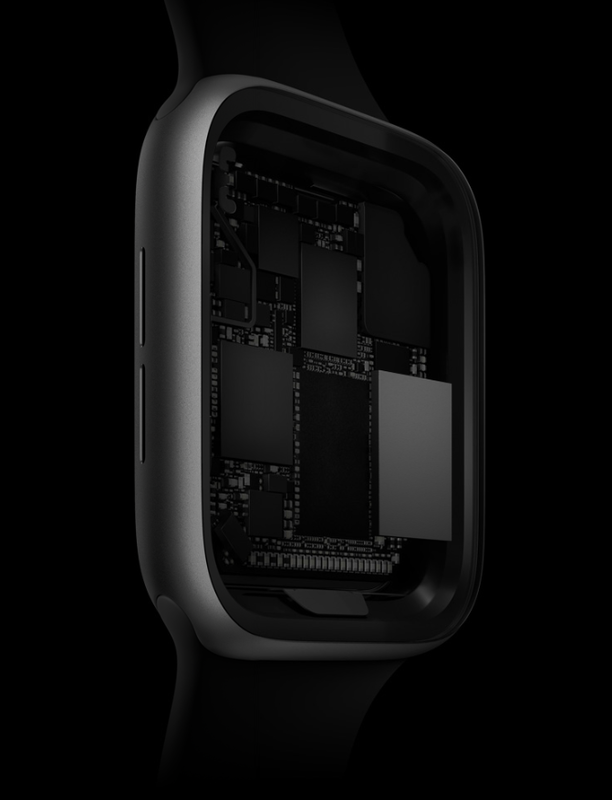 Already one of the most intricate systems Apple has created, the Digital Crown on Apple Watch Series 4 adds even more capability into significantly less space. The entire assembly is 30 per cent smaller, yet it includes 21 per cent more components. Keeps an eye on your heart. 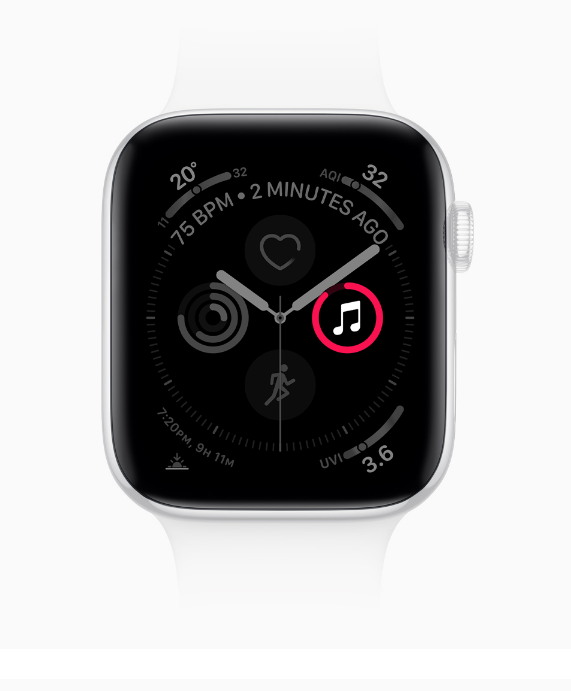 The optical heart sensor has been part of Apple Watch from the beginning, allowing you to quickly check your heart rate. 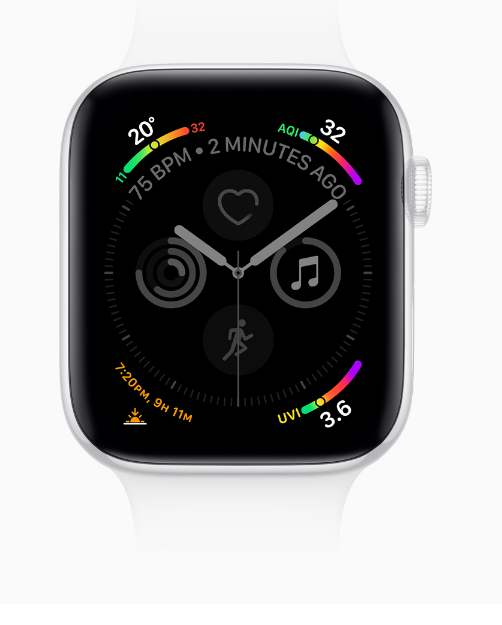 Now it can also detect if your heart rate falls below a specified threshold for a period of 10 minutes when you appear to be inactive, triggering a low-heart-rate notification. This can be a sign of bradycardia, which can be serious if the heart is not pumping enough oxygen-rich blood to the body. The biggest thinking happens in the smallest spaces. 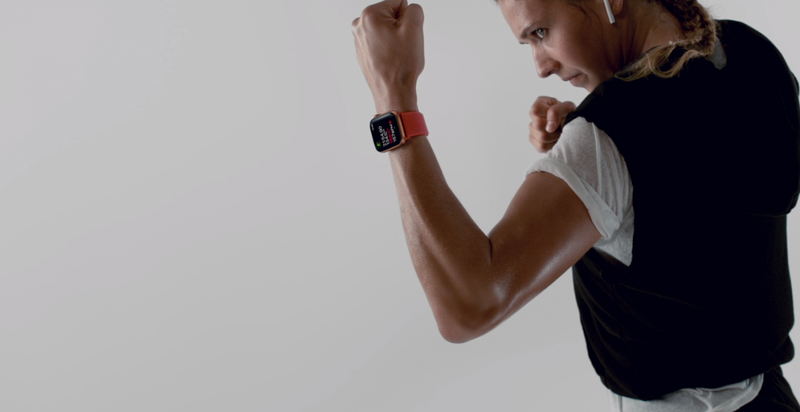 Optimised in every way, the new Apple Watch is more powerful, yet even thinner than before. And it delivers up to 18 hours of battery life on a single charge. Up to twice as fast. This fourth-generation CPU is faster than ever.2 Apps open more quickly, and performance is boosted across the entire system. 50 per cent louder speaker. 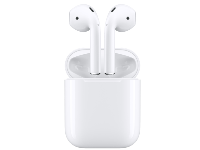 Bigger and even more powerful, the Apple Watch Series 4 speaker provides dramatically improved audio quality for Siri and Walkie-Talkie. In addition, the microphone has been relocated to the opposite side to reduce echo for clearer phone calls. Proactive Health Monitor - Part guardian, part guru. 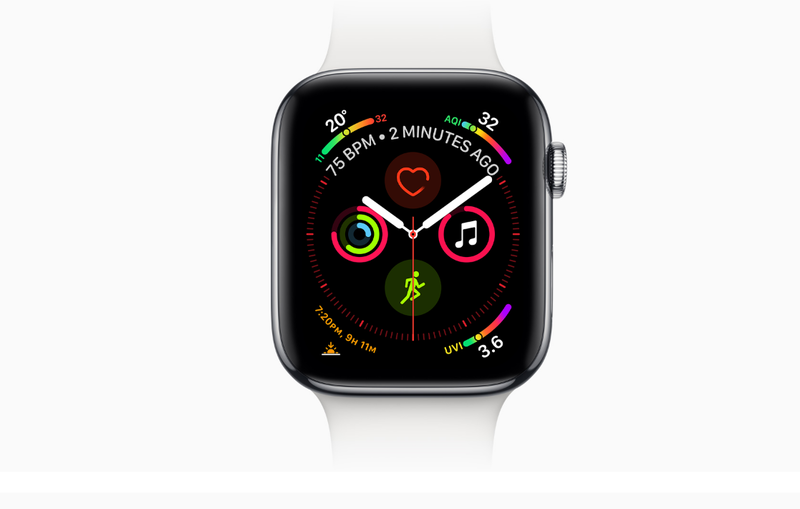 Apple Watch Series 4 inspires you to live a healthier life by helping you manage everything from everyday stress to calories burned. 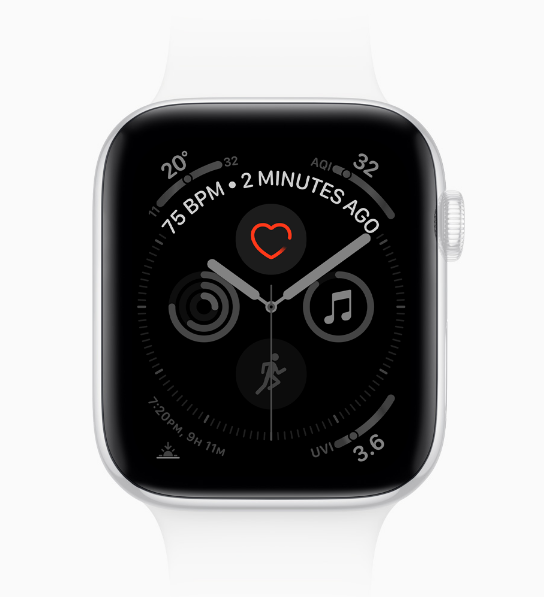 At the same time, it monitors your heart rate and lets you know if it detects something of concern. And that sense of security now goes a step further with fall detection and Emergency SOS. 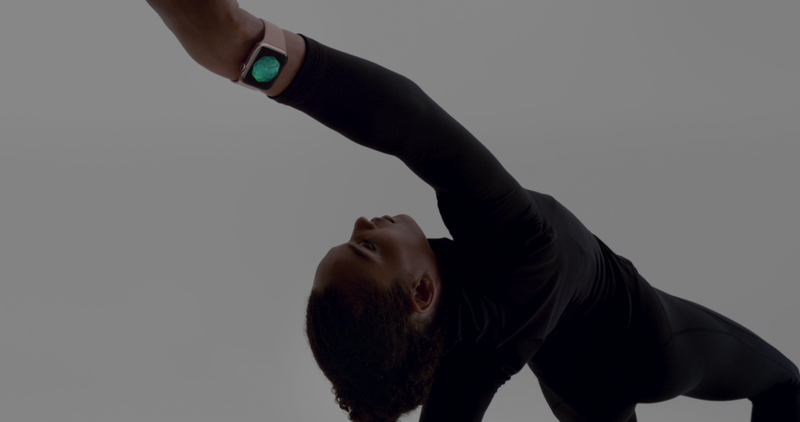 The new Apple Watch has your back - as well as your heart. Built with your heart in mind. 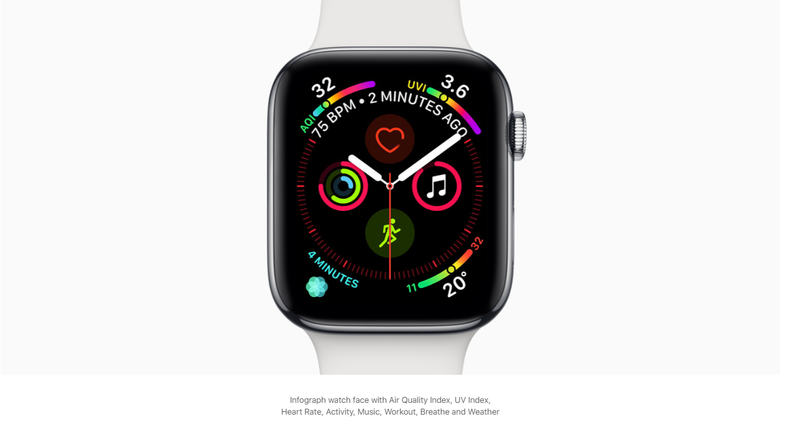 Apple Watch Series 4 regularly monitors your heart throughout the day, so you can check your heart rate at any time and keep track of your heart's performance. What's more, if it detects unusually high or low heart rates, it alerts you - even when you don't feel symptoms. On alert. So you don't have to be. High or low heart rates could be signs of a serious condition. But many people don't recognise the symptoms, so the underlying causes often go undiagnosed. 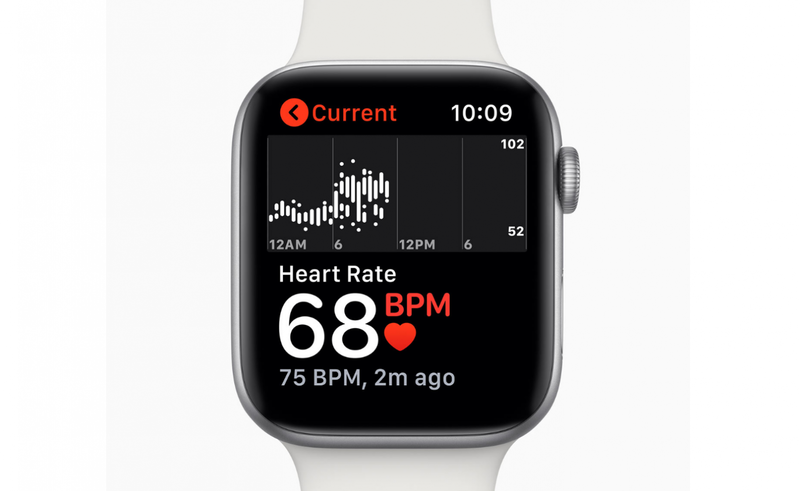 Apple Watch Series 4 checks your heart and alerts you to these irregularities - so you can take immediate action and consult your doctor. 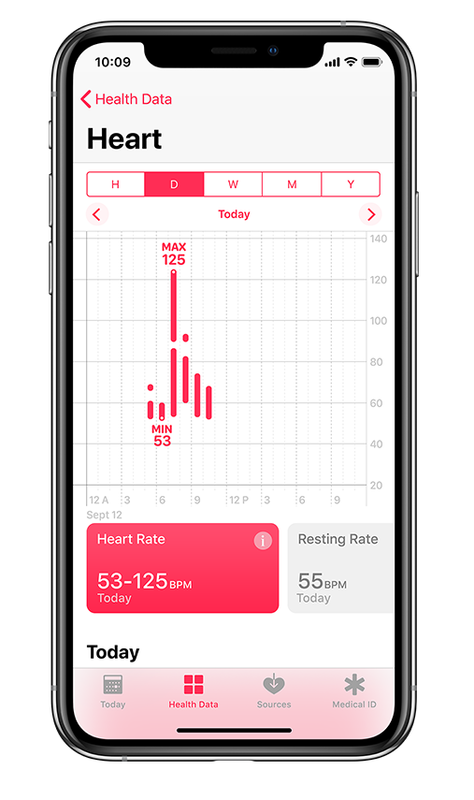 All your heart data, as well as information from your health and fitness apps, is collected in your iPhone Health app. Activity, sleep, mindfulness and nutrition are highlighted there in one snapshot. 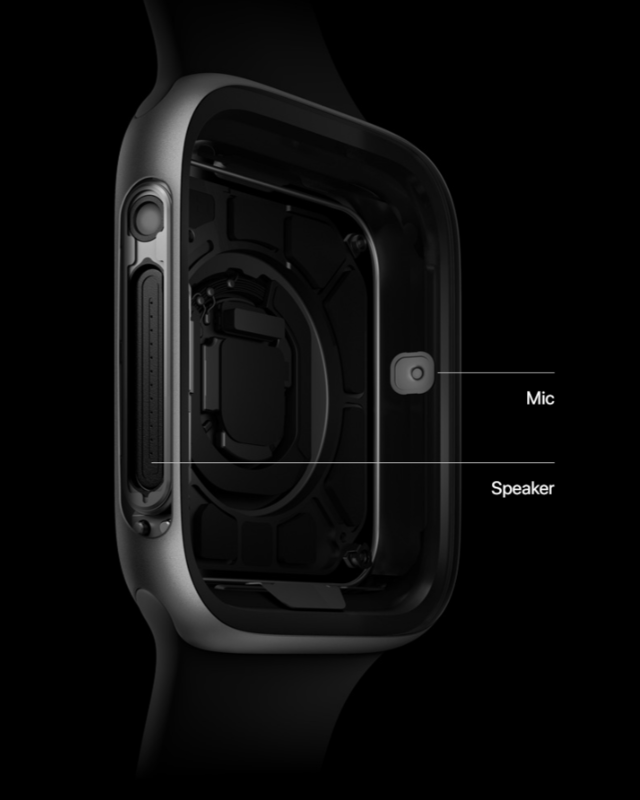 With the improved accelerometer and gyroscope, Apple Watch can detect that you've fallen. When an incident like this occurs, a hard fall alert is delivered, and you can easily initiate a call to the emergency services or dismiss the alert. If you're unresponsive after 60 seconds, the emergency call will be placed automatically and a message will be sent to your emergency contacts. 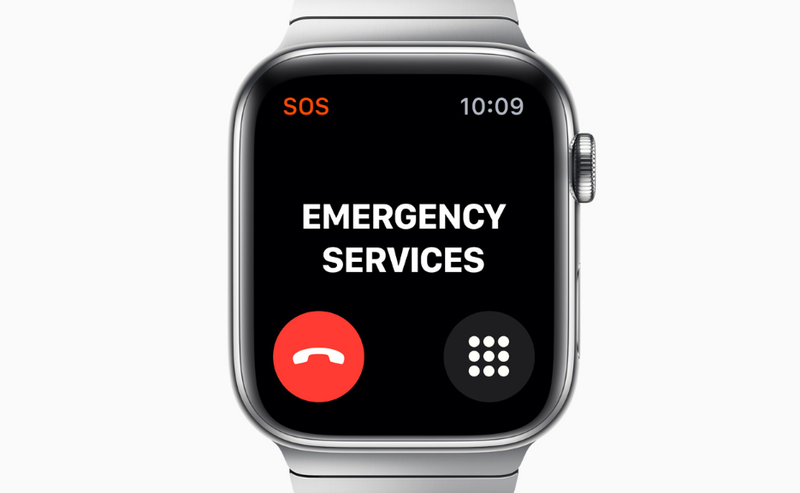 Emergency SOS allows you to summon help, right from your wrist. It calls for assistance, notifies your emergency contacts, sends your current location, and displays your Medical ID badge on the screen for emergency personnel. And Apple Watch does it even when you can't reach your phone. Fill your lungs. Clear your mind. Taking moments throughout the day to stop, relax and practise mindfulness can help reduce stress and improve overall health. The Breathe app keeps you centred by taking you through a series of calming breaths. 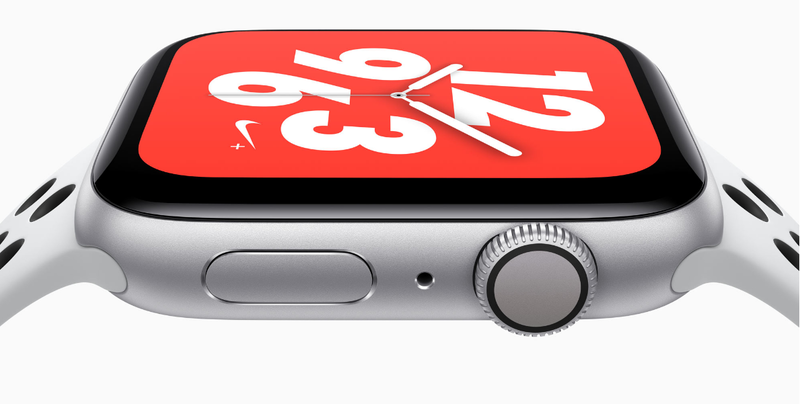 It's now available as a watch face, so you can bring focus to your day just by raising your wrist. Apps that make health the first priority. The right apps can play an important role in reminding you to keep up with healthy routines. Whether you want to drink more water, improve your sleep or better manage a condition like diabetes, there's an app designed to help you prioritise your goal. Ultimate Workout Partner - Workouts that work harder. 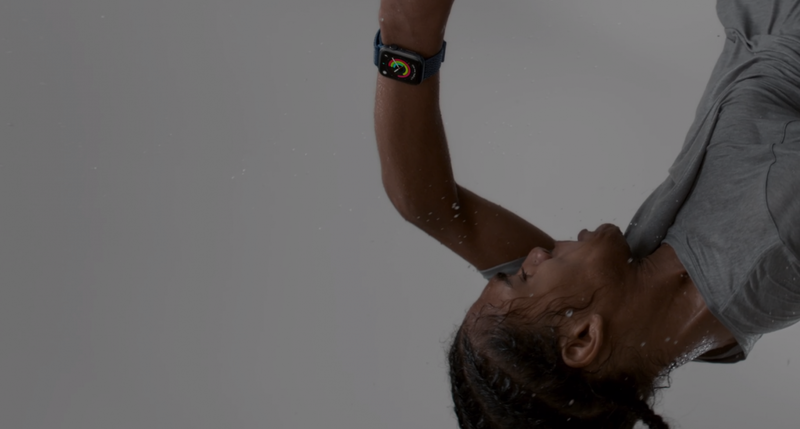 Apple Watch Series 4 is more than just a sports watch. It's like a trainer that understands the ways you work out - from running to yoga to swimming - and puts every metric you need on your wrist. With innovations from start to finish line, it's made for the athlete in us all. 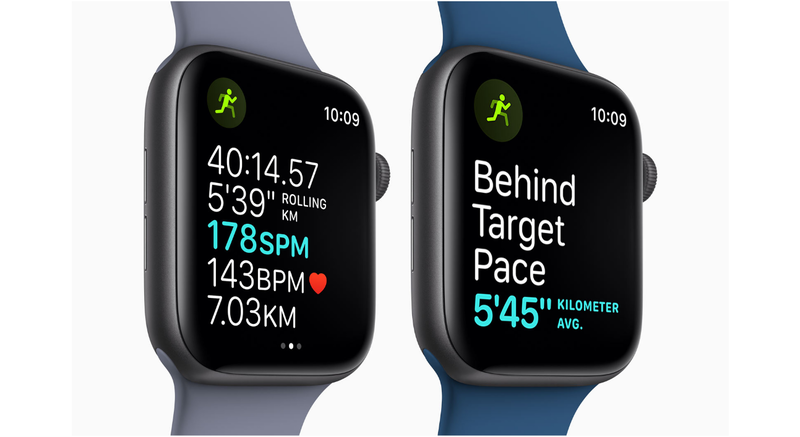 Whether it's training for a marathon or swimming laps at the pool, Apple Watch Series 4 has something for everyone. Now including yoga and hiking, the Workout app works every way you want to exercise. You can set individual goals, measure your calorie burn, and track your progress over time in the Activity app on your iPhone. Ready? Go. With a gentle tap, new pace alerts let you know whether you're ahead of or behind where you want to be. 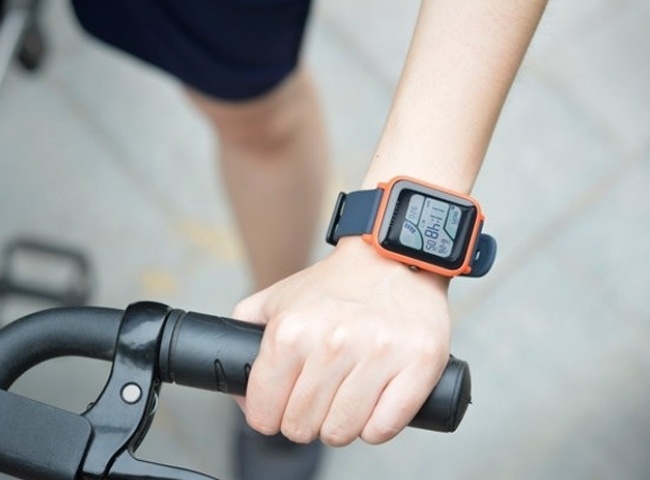 The new cadence metric lets you see your steps per minute. And rolling pace allows you to see your split for the preceding kilometre at any time. With just a tap, you can pair your watch with compatible gym equipment.1 So you can keep important metrics like heart rate, speed and calories in sync between your watch and the treadmill, stair climber or stationary bike you're on. 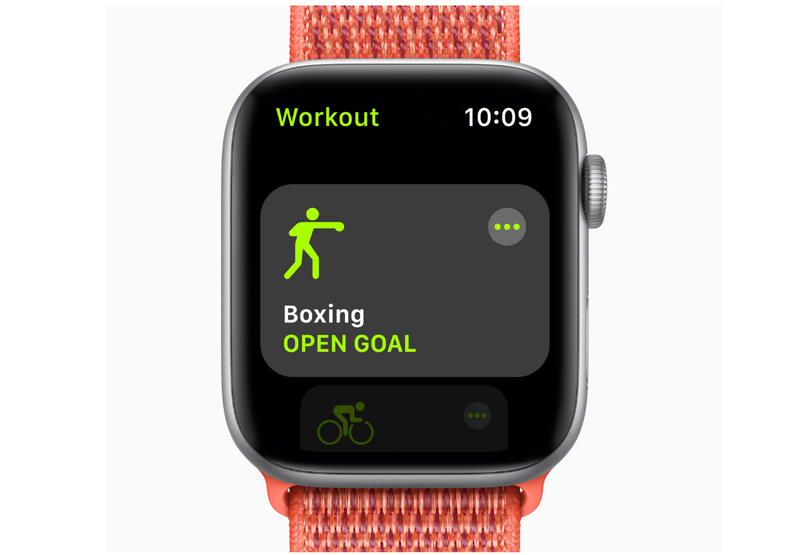 For most popular workouts, Apple Watch senses when you're moving and alerts you to start the Workout app. It even gives you credit for the exercise you've already started. It will also remind you to end your workout, in case you get distracted when you're cooling down. 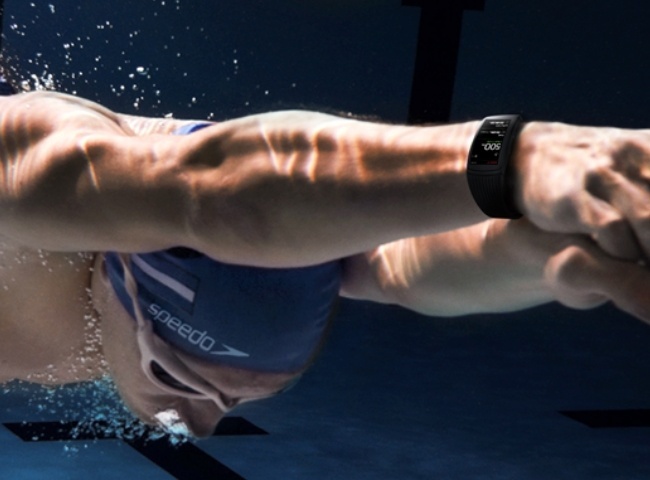 Apple Watch Series 4 is water-resistant to 50 metres and tracks both pool and open-water workouts.2 Turn the Digital Crown to eject water from the speaker using a burst of sound. Put your game face on. With room for eight complications, the new Infograph watch face can reflect whatever you're into, in richer detail than ever. Create your own customised workout face by adding complications like Music, Heart Rate or whatever else gets your pulse going. See the current temperature, the highs and lows for the day, and new indices showing air quality and UV levels. Get the motivation you need from Apple Music or Apple Podcasts streams. Put the Workout app on your watch face and shorten the distance from ready to go. See your latest heart rate reading in an instant, or tap the Heart Rate app for deeper heart insights. 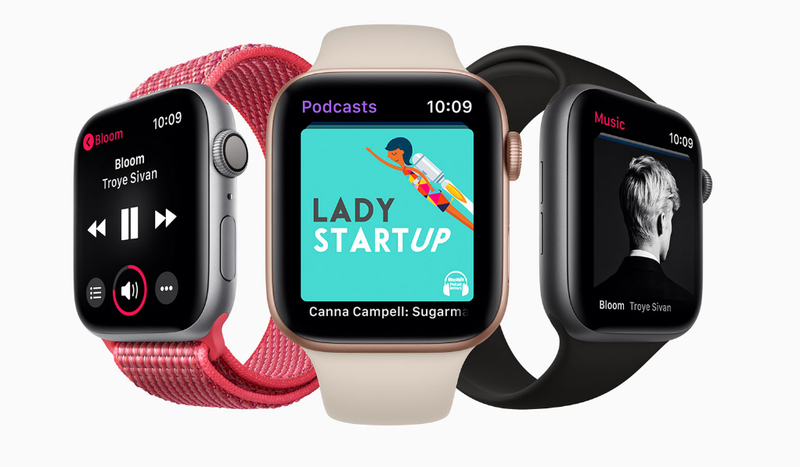 Whether it's an album or playlist from Apple Music, an episode from Apple Podcasts or a track from Beats 1 radio, you can get all the motivation you need, right there on your wrist. Choose from a host of third-party fitness apps to round out your exercise routine - and still get credit towards closing your Activity rings. Comprehensive Activity Tracker - Made to motivate. Understanding all the ways you move throughout the day is an essential part of living a healthy life. 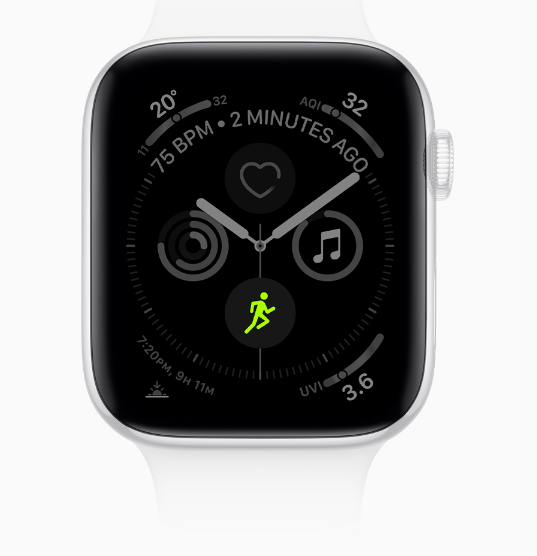 Apple Watch shows your daily movement in three simple metrics: Move, Exercise and Stand. 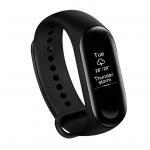 Together they make up the Activity rings that track your progress all day long. The goal is to close your rings each day. Apple Watch lets you share your activity progress from the mountains, the park or even the beach. And now, new Activity competitions let you invite a friend to a seven-day contest where you earn points based on the percentage of your daily Activity rings you close. During a competition, notifications will tell you if you're ahead of or falling behind your competitor, along with the score. So you'll know exactly how much you need to move to claim bragging rights. 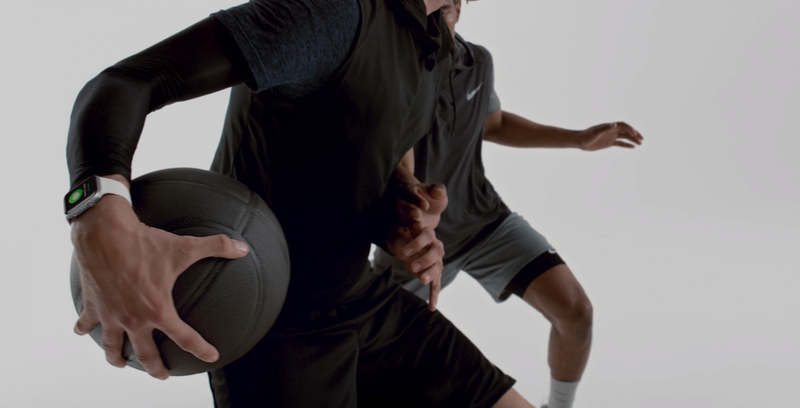 And like a personal trainer, Apple Watch will give you a nudge to close your rings at the end of each day, as well as offer up a new challenge each month. Every victory deserves a trophy. Now you can pick up a trophy when you seize a victory. You'll find your competition award in the new Awards tab inside the Activity app on your iPhone. Move. Exercise. Stand. They're the three Activity rings on Apple Watch, and an essential part of understanding and measuring all the ways you move throughout the day. Easy Ways to Connect - Stay close to what you care about. Never miss an important call or notification. Check in with a buddy over Walkie-Talkie. Listen to your favourite playlist or podcast. Or raise your wrist and ask Siri to order your usual. With Apple Watch Series 4, it's easy to stay connected to the information and people you love the most. 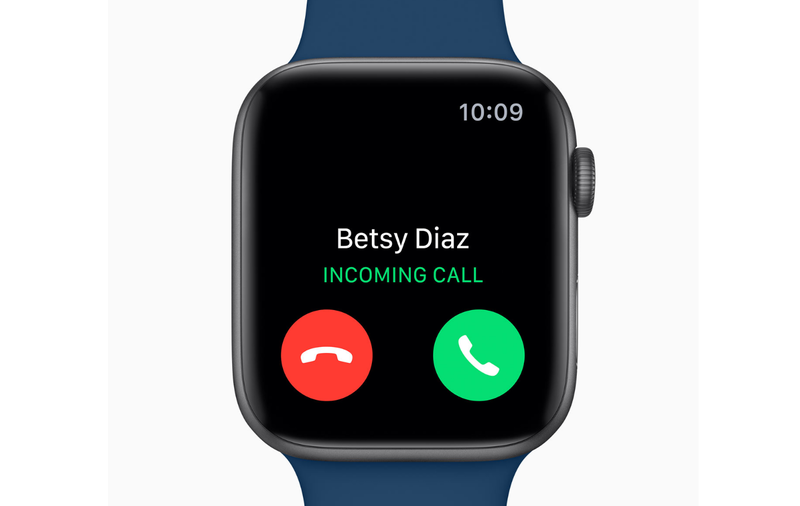 Take calls, send texts, listen to voicemail - Apple Watch Series 4 let you do it all straight from your wrist. Emergency SOS. A lifeline on your wrist. Can't reach your phone? 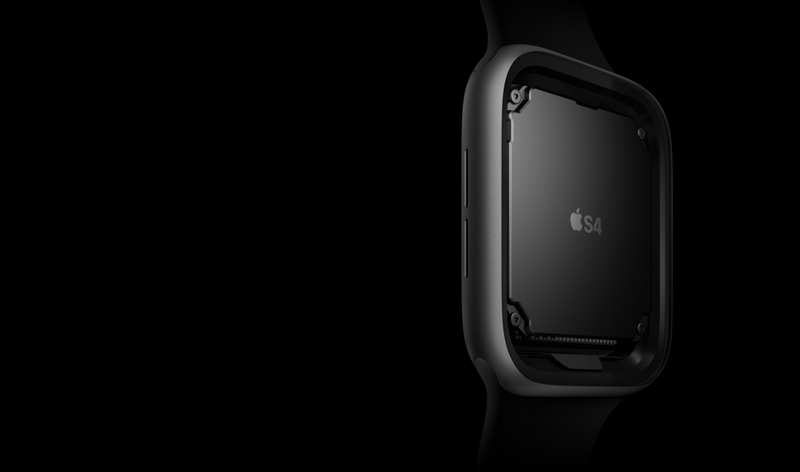 Emergency SOS summons help straight from your watch. 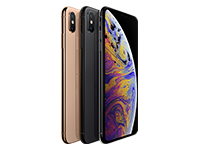 It calls for assistance, notifies your emergency contacts and sends them your location, and displays your Medical ID badge on the screen for emergency personnel. Quicker than a call. More personal than a text. 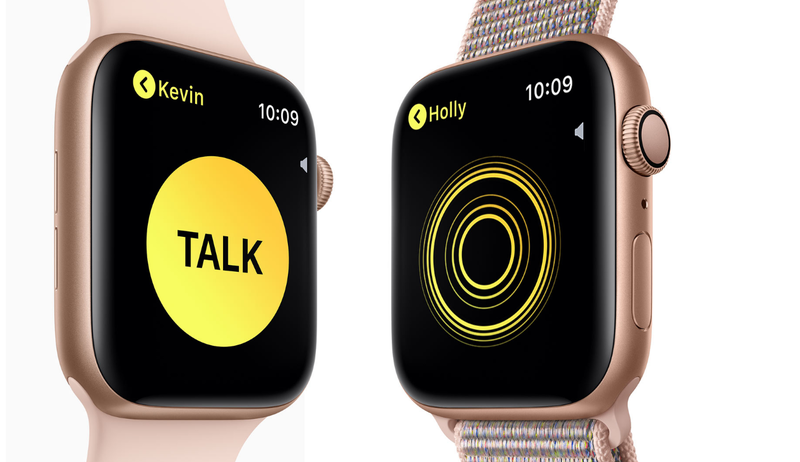 The Walkie-Talkie app lets you communicate in a fun new way with anyone who has an Apple Watch. Just press to talk. Let go to listen. Roger that? Siri is better in more ways than one. You no longer need to say "Hey Siri". Just raise your wrist and speak. And since the Siri watch face gets to know you as you use it, it can proactively make suggestions at the right time and place - like ordering your morning coffee. 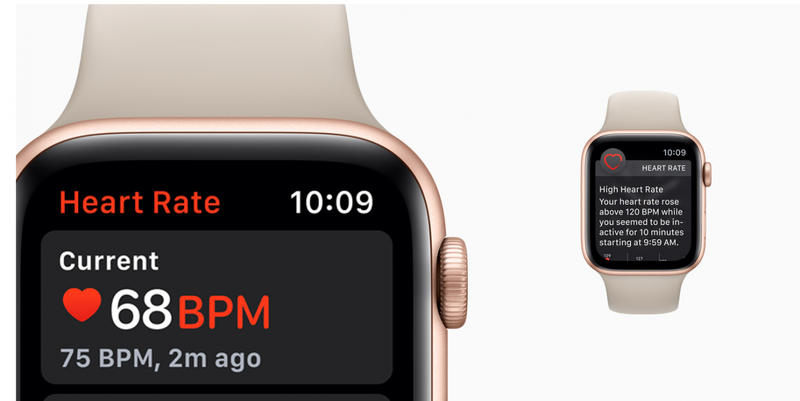 Stream anything from Apple Music and Apple Podcasts, directly from your wrist. You've got over 50 million songs to choose from. And a huge variety of stories, personalities and news. It's up to you. Rock your run or learn as you burn. 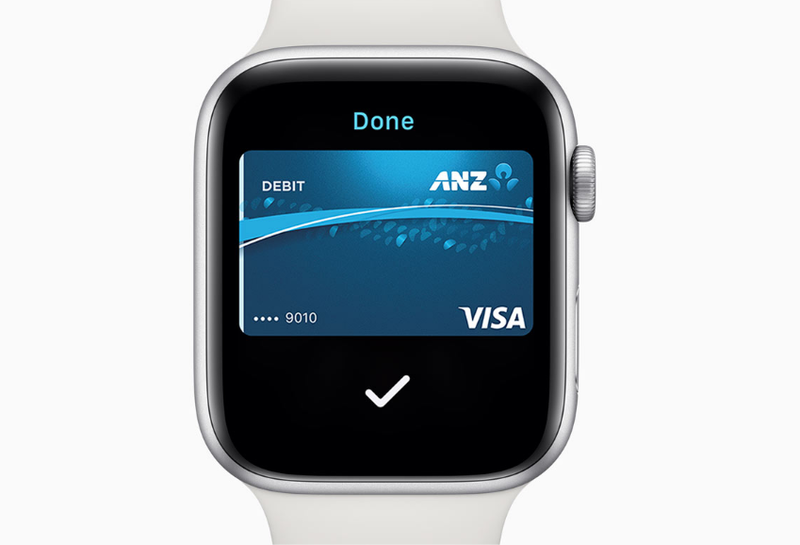 Apple Pay lets you pay for things using your credit or debit card simply by holding your watch to the check-out reader. No matter how you use it, Apple Pay keeps your financial information completely private and secure. A view with more room. 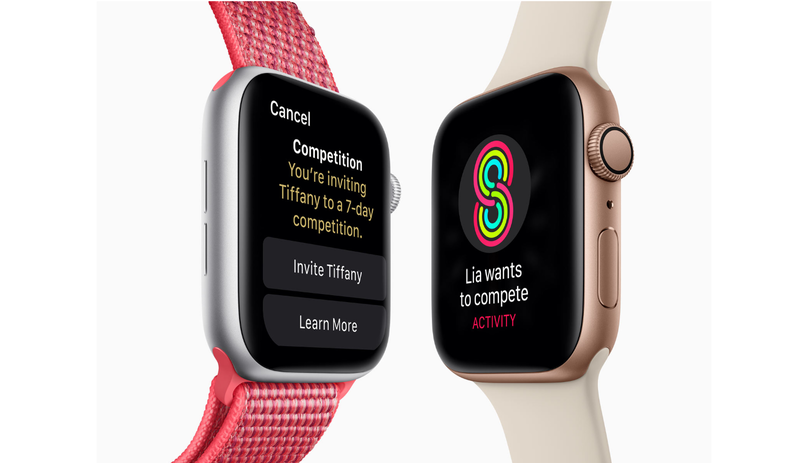 Thanks to the larger display on Apple Watch Series 4, you get more information and richer detail at a glance than ever before. Maps are bigger, stretching from curved corner to curved corner. Calendars are even more comprehensive and helpful. I'm loving my Apple Watch. I've been pleasantly surprised with the battery life to... an hour will normally give me enough juice to last all day and night.I'm loving my Apple Watch. I've been pleasantly surprised with the battery life to... an hour will normally give me enough juice to last all day and night. 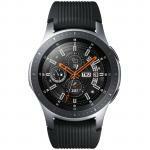 Awesome smart watch. Great if you are in to health and fitness. 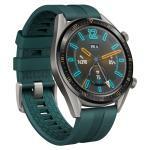 Highly recommended.Awesome smart watch. Great if you are in to health and fitness. Highly recommended. PB Tech price: PB Tech price: $651.30 ex. 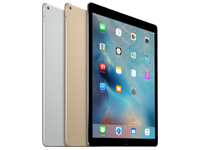 $749.00 inc.